Hitting level 100 in World of Warcraft is nothing out of the ordinary, but try it using only a dancemat. World of Warcraft has been around for more than 10 years. There have been novel approaches to reaching max level, from doing it without killing anything, to just mining. But now, a player has reached level 100 using an unorthodox controller - a dancemat. 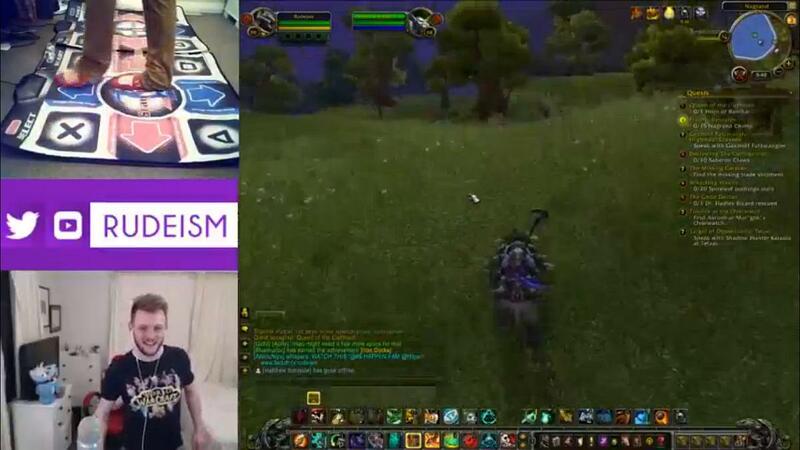 Twitch user Rudeism (via The Escapist) used a seven-hour stream to hit level 100 in a stunning 130 hours. He had more than 25 days of streaming, and accomplished the feat yesterday. You can see his final Twitch stream below. This isn't the first game that Rudeism has conquered a game in a somewhat unorthodox manner. According to his site, he has also conquered Rocket League, Portal and Counter-Strike Global Ops with a Guitar Hero controller, Superhot and Minesweeper with the dance pad and Mirror's Edge with a steering wheel. He is currently doing Undertale Genocide with dance pads, and hopes to get to Rocket League and StarCraft 2 with the dance pads and Portal 2 with a Guitar Hero controller. You can use one or two dance pads ONLY to play the game. Hands, keyboards and mice can be used for Alt-Tabbing, or logging in/out. Nothing else. If you can chat using the dance pads, it is allowed. Otherwise, no chatting via typing. Discord/Teamspeak/Twitch etc. are allowed for voice chat. Other players may make you bags, chat on your behalf and join you in dungeons or PvP, but cannot help in any other way. You may only run each dungeon ONCE. Dungeon boosting with 100s is not allowed. No heirlooms of any kind. You are allowed only ONE macro, no more. That macro MUST be /dance. BONUS OPTIONAL RULE: No setting your Hearthstone at all. Sounds like a cool challenege. I have 11 100s in WoW, but all of mine are conventional. I'm afraid if I tried with dance pads, the neighbors downstairs would call the cops on me for keeping an elephant in the apartment.